Ensure that your applications perform optimally --for all users, at all times, under all load conditions! Arm IT and QA organizations with CitraTest VU®-- Intuitive and accurate load testing for all Citrix, Remote Desktop Services & Microsoft Terminal Services environments! You rely on Citrix, Microsoft Terminal Services and Remote Desktop Services (RDS) applications to run your business and support daily operations. Yet, the number of users, remote branches and locations, user expectations, business requirements and traffic levels are constantly changing. Furthermore, on Citrix, Microsoft Terminal Services and RDS deployments, no underlying objects or controls are delivered to the client; instead an application image is delivered to the client UI. Therefore, server-based computing environments require a new load testing methodology designed to properly simulate virtual user interactions and accurately measure response time, under load, from your user’s perspective. This is exactly what CitraTest VU® delivers! 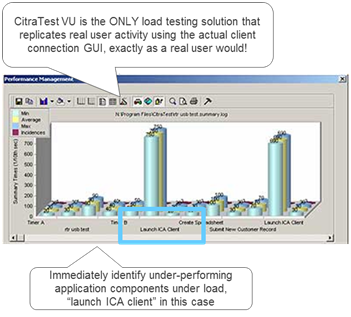 Mitigate risks and protect your organization with CitraTest VU® load testing! Test real user experience: Generate mouse activity and keyboard strokes –just like a real user–, and then test, measure and validate application response time, at the client UI, under various controllable load levels. Non-intrusive load testing: Rapidly test new applications without any code changes or production impact. Realistic and accurate testing. Each CitraTest VU® test script executes in its own "desktop" and opens its own client connection to the server-under-test, just as a group of real users would. See what the user sees. CitraTest VU® automatically compares what it “sees” on the screen to baseline response images, and measures and reports response times at the client GUI. Immediately identify underperforming components with Tevron’s proprietary intelligent image recognition capabilities. Flexible Testing. Validate complex multi-step scenarios (e.g. submit new customer sales record, launch ICA client, create spreadsheet, etc. ), easily customize load levels and virtual user ramp-up times -- you are in control! Maximize ROI with just one license: With CitraTest VU® you can load test all Citrix (XenServer, XenDesktop, XenApp, Presentation Server…), all Microsoft Terminal Services and all RDS environments! Roll-out new applications and technology with confidence. Mitigate risks associated with new technology deployment (virtualization, datacenter consolidation, application updates…).